Achilles tendon repair reconnects the ends of the broken tendon. This lets you use your foot again in a normal way. You could have one of two types of surgery. In open surgery, the doctor makes a cut at the back of your leg. This cut is called an incision. In percutaneous (say "per-kew-TAY-nee-us") surgery, the doctor uses a few smaller cuts. Tools for fixing the tendon are inserted through the cuts. Your doctor will decide which surgery will work best for you. Most people go home the same day as the surgery. How soon you can go back to work and your normal routine depends on your job. If you sit at work, you may be able to go back in 1 to 2 weeks. But if you are on your feet at work, it may take 6 to 8 weeks. If you are very physically active in your job, it may take 3 to 6 months. You will be in a cast or walking boot for 6 to 12 weeks after surgery. You may need physical therapy. Most people can return to sports in 4 to 6 months. Your leg will be bandaged and raised. You may have a drain near your incision. Your foot and ankle will be held in a cast or walking boot to limit motion. 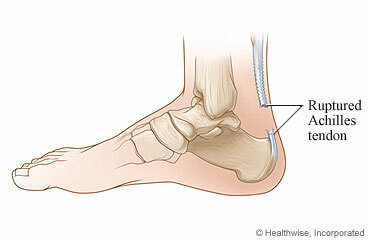 Enter M732 in the search box to learn more about "Achilles Tendon Repair: Before Your Surgery".